The budget hotels in Ajmer are ideal accommodation options for backpackers at affordable rates. These hotels, located conveniently in the heart of Ajmer, are situated in close proximity to the nearest airport, railway station, and bus stand. 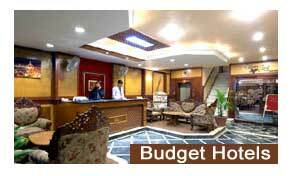 Many tourist destinations in Ajmer can be visited with ease from the budget hotels in Ajmer. Gorge upon an array of mouth-watering delicacies from Continental, Chinese, and Indian cuisines at the multi-cuisine restaurants at the budget hotels in Ajmer. Served with utmost hospitality, the lip smacking vegetarian and non-vegetarian delicacies on offer would definitely satiate your gastronomical desires. You can also unwind at the well-stocked bars with a selection of delightful wines and liquors. Ajmer is a charming city in the North Indian state of Rajasthan situated 130 km southward from Jaipur. It is a land where Hinduism and Islam merge harmoniously. While the tranquil Pushkar Lake is one of the holiest of Hindu pilgrim centers, the shrine of Khwaja Moinuddin Chisthi is visited by Muslims from various parts of the world. Other places of interest in Ajmer include the Taragarh Fort, the pillared mosque of red sandstone Adhai Din Ka Jhonpra, the 12th century artificial lake Ana Sagar, the Nasiyan Jain temple, etc.